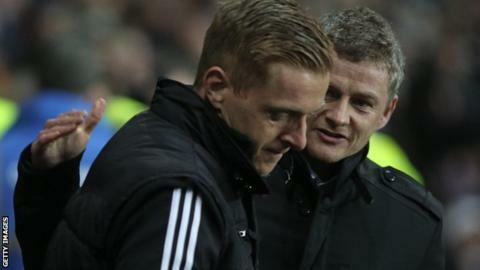 Swansea City boss Garry Monk says he has sympathy for Ole Gunnar Solskjaer, who left his job as Cardiff manager on Thursday. The Norwegian spent less than nine months in charge at the Swans' bitter rivals. He stepped down following three losses in seven games in the Championship. "I don't know the ins and outs of the daily stuff that they do there, but I just feel disappointed for him," said Monk. Solskjaer succeeded Malky Mackay on 2 January 2014, with Cardiff 17th in the Premier League, only one point clear of the relegation zone. But the Norwegian could not steer them away from trouble, and they were relegated on 3 May after a 3-0 defeat at Newcastle. The Bluebirds are 17th in the Championship after three losses in seven games, including Tuesday's 1-0 home defeat by Middlesbrough and a 4-2 capitulation against Norwich. "I think it's ludicrous really. It just carries on what's been going on there. Has Ole been given enough time? Absolutely not. "It's becoming a little bit embarrassing at times really the demands and the instant success that's required. It's becoming unattainable and unrealistic and I find it ludicrous that the man has lost his job." Former Molde coach Solskjaer and Dalman both cited a "difference in philosophy" for the former Manchester United striker's departure. Veteran defender Danny Gabbidon and Scott Young are in temporary charge for Saturday's match at Derby. Monk faced Solskjaer's Cardiff side as he took charge of Swansea for the first time, following the sacking of Michael Laudrup in February. The Swans beat the Bluebirds 3-0 at the Liberty Stadium and Monk was impressed with the former Manchester United striker. "When I spoke to him [Solskjaer] about football he was a very good guy, very knowledgeable and to me, seemed a very good manager," said Monk. "Looking at his relationship with his players from the outside, looked very good. "I think he's gone there in difficult circumstances and obviously wanted to change their philosophy and play more football shall we say and it hasn't worked out for him. "Obviously the owners dictate what happens and he's lost his job which is never nice."